By creating a patio you can set up an area for relaxation which is also a long-term labour-saving addition to your garden. Hard surfaces don’t need much maintenance in comparison to looking after a lawn or flowerbeds but it’s important to choose the type of patio which suits you and your garden. You really have three types of surface to choose from: wooden decking, shingle/gravel or concrete/stone tiling. Then you should think about the surroundings: do you prefer plants, would you like the area to be shaded or open or would you prefer permanent protection from the elements. Next, you need to consider how you want to use your patio: do you want to use it for BBQs, or is what you need just a quiet place to sit and chat or read, or do you want to entertain friends around a dining table? You might also want to consider whether you want to create an atmosphere using lighting as well as for practical reasons and whether you will want to use some form of heating when the UK summer takes a turn for the worse on that special day of yours. Where should you locate your entertainment area? Probably the most suitable location for your entertainment area is adjoining your house, accessing it through patio doors or French windows. However you may prefer to locate it away from the house for other reasons: the sunny end of the garden, somewhere with a view or an area not overlooked by the neighbours. Once you’ve decided on the location you will need to get the ground surface prepared and levelled first. It doesn’t need to be a rectangular shape; circles, semi-circles and curves generally are easier on the eye. What materials should you use for your entertainment area? 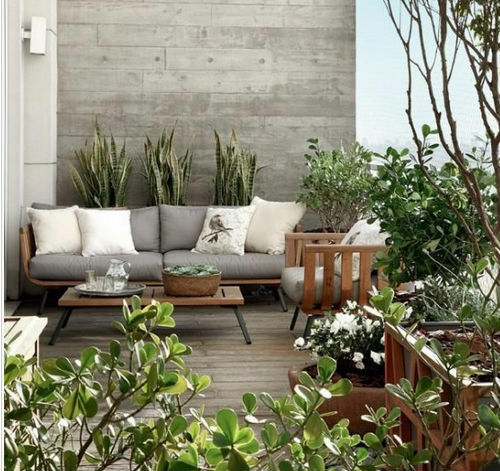 Wooden decking and shingle blend in more with the natural textures of garden plants but need more care and attention to maintain a pleasing appearance. Wooden decking is useful for covering more difficult areas and needs to be pressure-cleaned at least once a year whereas a gravel surface needs to be edged to keep it in place and then raked over and regularly cleared of any weeds or debris. The most expensive but most easily maintained surface is a solid concrete or stone patio. The cost can be kept lower by choosing concrete tiles and these can be cut into geometric shapes which fit together and can also be edged by contrasting tiles for a more interesting effect. Alternatively you could splash out on some high quality light-coloured York stone slabs or what about going for a darker Delabole slate? Whichever you decide, it is a time-consuming and skilled job and probably best done by someone with the necessary knowledge and experience to get a professional-looking and long-lasting finish. A job worth doing! What atmosphere do you want to create around your entertainment area? Once your surface has been laid and allowed to settle, you’ll want to think about the surroundings. 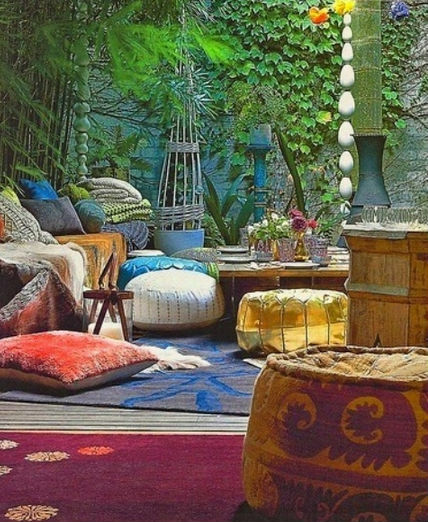 A shady patio can be kept brighter by painting adjacent walls a light colour and maybe use a mirror for reflection or to create a feeling of more space in a small area. Do you want to be able to shade the seating area on a sunny day with a parasol or gazebo or would you prefer a more permanently sheltered space in case of either good or bad weather? 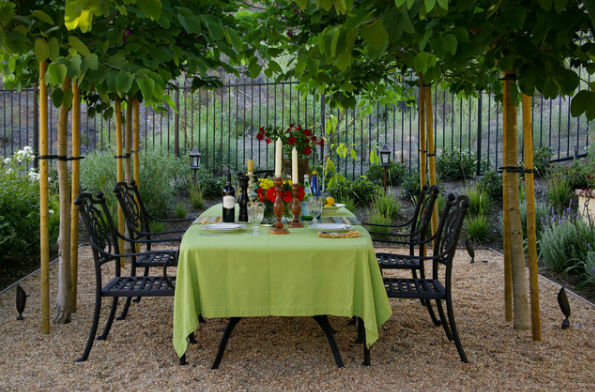 You could have a wooden framed pergola draped with protective matting or maybe train a plant like wisteria to spread over the framework to create a more natural look.Whichever you choose, you’ll probably want to arrange some plants in pots around your patio unless it is already in a well-planted and mature garden area. Choose luxuriant shade-tolerant plants like ferns or evergreen plants to keep maintenance to a minimum. The next thing to think about is the right sort of furniture for your needs. 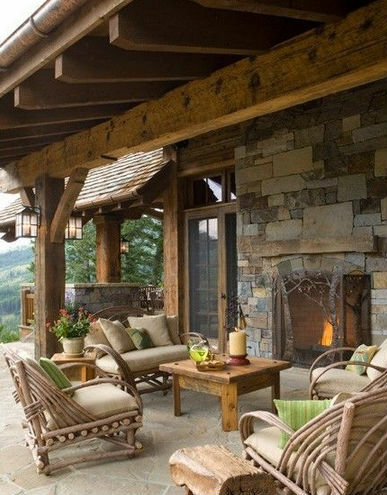 What is the purpose of your patio? If its function is as a relaxation area, then you’ll need to choose low level sofas and chairs and a coffee-table type surface for drinks, books, magazines etc. Do you have somewhere to store your furniture in the winter months or during wet weather? If not, you can buy weather-proof plastic raffia-effect furniture along with some cushions for comfort which can easily be stored indoors when necessary. On the other hand, if you want to use your patio for dinner parties and comfortable eating generally, then you’ll obviously need a dining table and chairs. Again if you don’t have storage space, it is possible to buy quality hardwood furniture which you can leave out all summer long and then maybe cover with a waterproof cloth to protect against the harder winter elements. As for the food, either cook it indoors first and proudly carry it to the table or wheel out the portable BBQ and let the men do the cooking! Last but not least is perhaps to consider creating a mood or atmosphere by using lighting and/or heating if you want to stay outside well into the night at the height of summer or you want to be comfortable and able to see what you’re eating other than just by candlelight. If the area has easy access to electricity then you can use LED type lights which can provide bright sharp pinpoints. In a relaxing area, a softer effect is created by using solar-type lighting and of course no wiring will be necessary. As for heating , the best choice is probably a chimera wood-burner using logs and this will both look and feel comforting. A patio burner, as often seen at outdoor cafes nowadays, is effective but not environmentally friendly or attractive to look at. This article was posted in Landscaping and Gardening. Bookmark the permalink. Follow comments with the RSS feed for this post.Post a Comment or leave a trackback: Trackback URL.